Ram Charan’s upcoming mass entertainer Vinaya Vidheya Rama shoot is nearing completion, and the talkie portions have almost been completed except for the patch work. The makers are now busy with songs shoot in Hyderabad. 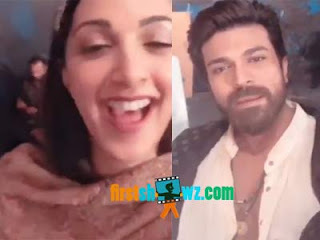 A peppy and foot tapping number is being shot in special set erected in Annapurna 7 acres, and Ram Charan shakes leg with beautiful Kiara Advani. Devi Sri Prasad composed the music for Vinaya Vidheya Rama taking shape in Boyapati Srinu direction. The energetic song shoot will be wrapped up by the end week. Ram Charan will immediately join back on the sets of Rajamouli's RRR also starring c is producing the film under DVV Entertainments banner. The film also has Aryan Rajesh, Prashanth, Sneha in key roles. Vinaya Vidheya Rama is a commercial mass entertainer, slated for Sankranthi release on January 11.